I wasn't interested and informed them. But this one was persistent and was unwilling to let me escape. On and on she talked. Didn't want to know anything at all about me, my needs, my business, my opinion on cold call telemarketing, anything about me at all. She was interested in getting through her script presumably to earn a pay check. I gave up being polite and cut the call. I have often wondered if any of such calls ever achieve their goal. I have yet to meet anyone who relishes receiving these cold calls. Purely speculative, scatter gun. And yet, so many of my clients complain of meetings and presentations that they willingly attend where the presenter is concerned only with getting through their script, in spite of the audience's wants, needs opinions and preferences. OK, perhaps "willingly" is a stretch. Grudgingly, then. In the last episode, we discussed what your audience already Knows and what they Need to know. And how you, as the presenter, need to make sure that you identify your 10% that they really must take away. This time, we are looking at the audience's Opinion and Who they are. I worked for a client a little recently where the Country manager was having problems with the local leadership team. Technically, the individuals were all brilliant and excellent, they just didn't get along together very well. There was quite a bit of power play going on and inter-department blaming and rivalry was rife. Essentially, they weren't playing well together, and like a football team that doesn't support each other well, they were getting thrashed by the competition. As is often the case in such situations, the team members thought rather negatively about "this soft, fluffy stuff" and that the problem lay with the company's processes and other departments, not their team and certainly not something any coach could fix. They weren't quite ready to instantly change their behaviour... well at least until the other party admitted that they were wrong and changed first. And sometimes it is personal. It's not your role they disagree with, it's you. In these politically correct days nobody says what they think, but they sure do think it. Maybe they prefer a female, maybe you need to be Asian to understand the local culture. Maybe you should be an engineer. Maybe the way you dress is deemed as threatening. Even with a non-hostile audience, you want to know what they think about you and your topic before deciding how to approach your presentation. What do they think of you and your topic? I was enjoying my new position installing computerised tills and stock control systems throughout the central London pub estate for Chef and Brewer. My boss was a great guy and everything was going brilliantly well until he got replaced by an arrogant, opinionated know-it-all, who, quite frankly, understood nothing about computerisation and worse, hated the idea of it. This was the late 1980's and my new boss was determined to halt the technological advance at all costs. Within a month I felt like Sisyphus. Pushing the computerisation agenda up an increasingly steep hill and soon to be crushed by the backlash. I hadn't had time to build any real influence nor win any significant political allies in the organisation and my colleagues soon joined my new boss in undermining and stalling progress. My personal credibility hadn't been established securely enough and without it, I was going to struggle to overcome the logical and emotional resistance that I was convinced were at the root of the problem. Aristotle noted that there were three key forms of resistance in an audience: Ethos, Pathos and Logos. The character or credible appeal of something or someone, the emotional appeal and the logical argument. It is often difficult to distinguish whether it is you or your topic that is causing the problem. Certainly, your personality colours your opinion about the topic. But when you are on the inside, it always feels personal. To give your case the best possible chance of success, you need to establish credibility with your audience, present your logical argument and appeal to their emotions. That is, you need to win their hearts and minds. Notice the word "win" - because in every presentation, yours is just one more voice contending to be heard and acted upon. People do resist change, and anytime that you are presenting you are instigating change. When your argument makes the audience FEEL that you are picking them out as non-compliant, wrong or simply for being different, then your argument falls on deaf ears. To ensure that your argument stands a chance of being accepted. You need to know what they think of you and think of your topic. And the easiest way to do that is to ask them. I didn't understand all this back in the late 1980's in London. I just bulldozed my project through as best I could. Fifteen months later, I was generously made redundant the day I installed the last pub in the estate. 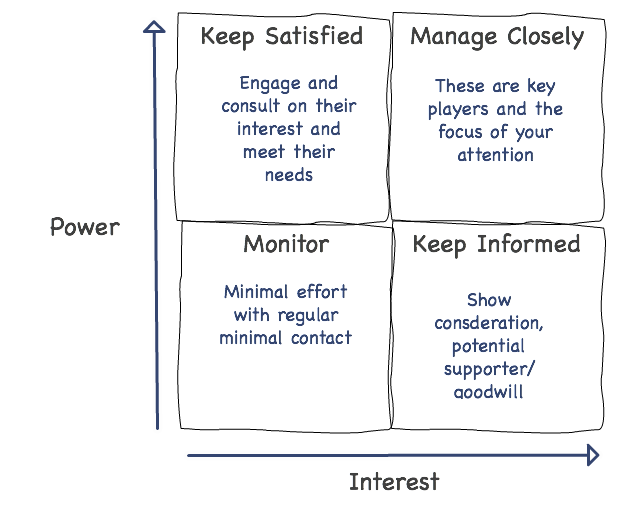 Stakeholder or audience mapping uses a simple 2x2 matrix with Low to high power on the vertical axis and low to high interest across the horizontal. Consider the specific individual members of your audience and place them on the grid relative to each other. Include, where appropriate, stakeholders who might not be personally present but sending a representative (aka spy). Your focus in your presentation are those individuals who are most interested in your topic and have the power to affect the change you desire. When you are preparing a sales presentation, for example, it pays to know who is the key decision maker (powerful) and the most interested. Not always the same person! I often find myself presenting to greatly interested people with little power and the person with the actual power isn't even in the room. I think of this as a gatekeeping presentation and once through the gate, I have a chance to pitch to the person with the power. When you have a clear idea about the power and interest in the room, it's time to establish how you call the four different audience types to action. Doers, Suppliers, Influencers and Innovators. A Doer is someone who instigates activities. You should ask them to assemble, make decisions, gather, respond or attempt. A Supplier is a person who controls resources. Ask them to acquire, fund, support or provide resources. Influencers change perceptions. Ask them to activate, convert, empower or promote. Innovators generate ideas to add value to and spread your ideas. Ask them to create, discover, invent or pioneer. How do you call to action if you don't know their type? Intuitively you can see that these four audience types make sense. When you know your audience well and have experienced presenting to them before, it's relatively easy to pin them down to a particular type. But there will be times when you don't know them well enough. In such a situation, make sure to sow those key action verbs throughout your presentation noting who responds to each, usually shown through greater attentiveness, a smile, a nod or simply paying attention. Note also any of the verbs that appear to fall on deaf ears, you might not, for example, have any innovators in the room. Above all, be sure to establish the audience type for the most powerful interested stakeholder and focus on getting the right call to action to them. Your call to action for this episode is to identify your audience, map them on a simple power/interest grid and work out, if you can, their audience type. I use post-its on a whiteboard (real or virtual) to help me in planning. And once I have identified the key stakeholders (high power and high interest) I take a little longer to get to find out what they know, and specifically what they need to know and take a little extra effort to understand their opinion and create a call to action that will activate them to fund the resources we need to make the change they need.